Time, as always, had flown by since the previous Club100 race and round 3 had suddenly crept up on us. This time it was a trip to North Wales and, after the first two rounds, we’d started to take a nice hot sunny day for granted on race weekends. Sadly the Welsh weather gods had a different idea this time around and the forecast was for showers… And lots of them. Wet weather takes driving a Club100 kart from being a reasonably challenging but fairly straightforward kart to drive and morphs it into a slippery tail happy beast. Even worse, it had been about 18 months since I last had the displeasure of doing any wet weather racing (queue the ‘fair weather karter’ abuse). The prospect of driving a new circuit in these kinds of conditions wasn’t really one that I relished. 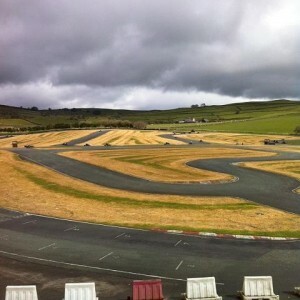 Before we start, there’s one thing that I have to mention: Glan y Gors is a fantastic circuit. Until now I’d been a huge advocate of Buckmore Park, which is probably still my favourite track in the UK, but there’s really not much in it. There’s something for everyone – immense speed, a great downhill section and a sequence of 3 technical corners that have you feathering and easing the kart as you try not to bin it. If you get even half a chance to make a visit, do it – you’ll be smiling for a week! You may have noticed that, so far, I’ve been a little quiet as to the result… Which is for a good reason. Unlike the previous couple of races there are no podiums this time. Qualifying went reasonably well – 6th in class – as did the start of the race as James kept it facing the right way as the rain came down. Sadly, things started to go wrong shortly after that point. From my esteemed team mate making a rare error and crashing into the pit wall to me having a few bundles and ended up going backwards on the grass a couple of times we ended up way down the field. To be honest, if it was dry I really do think we’d have been in with a good shout. The temptation to try and push too hard in the wet probably just got the better of us, and instead of sticking to plan and keeping the kart pointing forwards we tried to force things. For me, the worst part was when the rain stopped just into my first stint and the track started to dry. Somehow I’d smeared oil and filth over my visor so couldn’t see where the grip was and ended up losing a huge amount of time that I really shouldn’t have done. Having said all that, we still came out with 70 points which leaves us 2nd in class. Next up there’s a big break until the end of June (we’re not racing at Llandow) which we go into feeling fairly positive. Two tracks in a row that we’ve never driven and we ended up with 160 points out of a possible 200. Not bad, but there’s a long way to go! Finally, a massive thanks to everyone at the Eagles Hotel for putting us up (although plying us with alcohol maybe didn’t help much for the race).